Vodice is a tourist destination located by the sea in a bay, not so far away from the town of Sibenik ( around 10 km). The city is rich with water and that is exactly what gives it its name- Vodice which could be translated to “Small waters”. 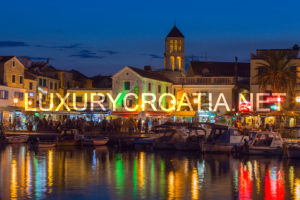 Vodice is an ideal destination with vivid summer nights and rich offer where everyone can find a bit for them own self. If you are looking for an active vacation, Vodice is perfect for you, and to prove this, Vodice received an award named “The flower of tourism” which is given to destinations that have a specially attractive tourism offer. There are many sports that you can engage here, such as volleyball, basketball, soccer, cycling, diving and others. Another award that Vodice obtains is the so called “Blue flag” award, given to the town for the large marina in the center that has more than 400 berths, mostly for the infrastructure and other services that they offer. There are beautiful beaches in Vodice for you to visit, sunbathe, swim and relax in, such as the Blue Beach (Plava plaza), especially interesting to children. To witness the past of Vodice, there is a number of monuments to visit. The Church of St. Cross is a simple Gothic church built in the 15th century, which was dedicated to the St. Cross and back then it was also a parish church as well. Today it is an example of the sacral rural architecture, famous for the only Romanesque-Gothic detail in this area, a bowl standing on one of the columns. The Coric tower is a sight to see as well, a unique fortified tower with high walls, built with the stone brought from the island of Brac. Today, the tower is not available to visit because of its poor conditions, but during the summer months, the courtyard is used as a movie theater in the open air. Another church is the Parish church of St. Cross built on the base of and old chapel connected to the baroque atmosphere with decorated interior and windows in the spirit of that era. It also has a main altar dedicated to St. Cross and a bell tower with two balconies. If you want to explore some natural beauties as well, there are a couple of national parks that are not far away from Vodice that you can visit. Some examples are the Kornati archipelago, the Krka river National park and the small Skradin town, the Nature park Vransko Lake and other sites. To follow the relaxed atmosphere in the nature, Vodice will offer a lot of healthy and light food that is a real delicacy here in Dalmatia. This means all sorts of fish, caught straight from the sea and prepared in variety of ways, most often served with boiled vegetables coming from the small front garden that most of the houses have in Vodice. Another delicacy to try here are the sweet wines, Maraschine, that has a really delicious taste thanks to the type of the grapes that grow in this area. It is recommended to try these fines after the desserts, some crusty krostule of fritters.